A Song Legacy customized wedding song will provide the perfect touch for your own wedding reception or ceremony, or will be a unique gift to the bride and groom at the rehearsal dinner or reception. Customized wedding songs also can add a unique personal touch as an accompaniment to a wedding video or for a slide show to be shown at the rehearsal dinner. The lyrics of the custom wedding song will be created from the information you give us, and set to original music by one of our talented composers. The song will then be recorded by a professional male or female vocalist and delivered to you along with an optional personalized lyric sheet and CD cover, using the photo(s) you provide. To get an idea of the quality and variety of our songs, listen to a few of the song samples on the right of this page, or go to our Customized Wedding Songs page to learn more about the songs, hear samples of complete songs, and see lyric sheets and CD covers. We also offer inexpensive MP3 downloads of our original wedding compositions for bridal entrance, mother-son processional, first dance and other wedding reception dances. These songs feature lyrics designed for use at any wedding, without unique personalization for a particular customer. You can hear a small sampling of these songs in the song sample box on the right of this page, or go to our Wedding Songs MP3 Download page to learn more. Listen to a few samples of our wedding songs (requires Flash Player 7 or higher). Click on name of selection below to hear an excerpt from the song. Hear more song samples and learn more about our personalized wedding songs and inexpensive MP3 downloads of original wedding songs. Listen to and learn about our Personalized Wedding Songs, with lyrics based on the story of the wedding couple, and set to original music by our composers. Find out about our inexpensive downloads of original wedding songs in MP3 format, with lyric sheets and CD covers. See our large collection of designs for wedding song lyric sheets and CD covers. Learn more about Custom Wedding Songs and our talented composers, lyricists and vocalists. Read Comments from Custom Wedding Songs customers. We hope our Wedding Links will help you plan the perfect wedding. Go to the Song Legacy website to learn more about the company and hear sample songs for other occasions. Prices for fully customized wedding songs with original music written by our composers and personalized lyrics start at $749 and vary depending on length of the song and features included. Shipping and handling charges apply if a CD and lyric sheet are shipped to you, but there are no shipping and handling charges if you select electronic delivery. 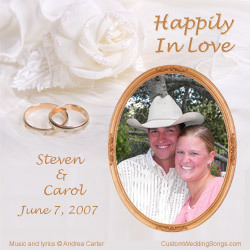 MP3 downloads of our original (but not personalized) wedding songs are $9.99 per song. To find out more or ask us a question, fill out our online Contact Form, or contact us via e-mail or phone, using the contact information below.